Librarians are now, more than ever, community educators as well as information providers, navigators, and facilitators. With so many competing priorities, how do we ensure that we are working together toward shared goals, intentionally and purposefully, in alignment with our communities’ priorities and our libraries’ missions? We cannot innovate, transform, or look outward if our internal relationships and our teams are not strong and sure. We all have to agree on how we will move forward together. 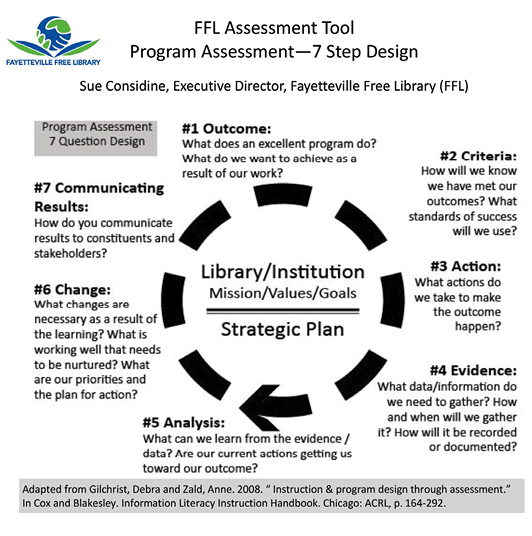 Here at the Fayetteville Free Library (FFL; www.fflib.org) in Fayetteville, N.Y., we successfully align with our community through deliberate planning and assessment processes. We all understand that our current metrics and data are not doing us justice. Numbers alone cannot tell us what we need to know about the value and impact we bring to our communities. If we have little or nothing to learn from the numbers alone, imagine how difficult it is for our stakeholders to effectively make the case for the sustainable funding that allows us to continue to grow, evolve, and serve. Realizing this is an industrywide problem that we are also faced with at our local level, I undertook a research project, which brought me to the conclusion that there are existing models and ideas I could adopt. As the executive director of the FFL, I wanted to guide my team members (our organization is designed to employ “team members” not “staff”) in a three-step process: 1) focus our priorities, work, and resources; 2) collect meaningful data; and 3) work to communicate the results more effectively. Through my research, I became especially interested in outcomes-based planning, which includes program-planning and management tools that assist with proposing, funding, and implementing ideas (Harvard Family Research Project, Volume Xl, No. 2, Summer 2005). Targeting outcomes of programs (TOP) is a model based on a hierarchy of sequential steps in planning, implementing, and evaluating programs. Evidence-based planning is the process of basing decisions on objective information in order to achieve the best possible outcomes (NGO Connect, No. 46, January 2012). Consequently, I adapted and iterated on the ideas above and combined the best ones to develop a two-part plan that brings together proposal and assessment in a way my team members could easily understand and integrate into our daily work. I’ll share what we’ve implemented here so it can help you make better plans and outcomes-based decisions. At the FFL, every new idea, whether big, small, mundane, complex, or wacky, begins with completing an official proposal form.This compels the person who generates the idea to test his or her own thoughts against several parameters before submitting it to me for preliminary review and discussion. (See the 1.5-page form at http://fflib.org/images/pdfs/proposaltemplate.pdf.) To facilitate this, I have monthly meetings with each member of my professional team and an open-door policy to support idea generators. Is it in alignment with our mission? Is it in alignment with our current priorities and service goals? Are the intended outcomes clearly defined? What resources exist and/or what new resources will be required to execute it? Once an idea has this preliminary green light, I assign it to one of our five monthly team forums. Here’s how they work: Each of these forums is focused on particular content or a service area (see the sidebar). I require all professional staffers to attend one of the monthly meetings. (Support staffers are encouraged to attend if their schedules allow.) Each forum is facilitated by a member of my professional team, and each has a note taker who must keep notes and turn them in to me within 24 hours of the meeting. 1. Leave your ego and title at the door. It makes no difference what your primary area of responsibility is, what your title is, or how long you have been an FFL team member. All perspectives are represented at all forums, allowing for cross-germination of ideas and regular “eureka!” moments that would not be possible in departmental-type meetings or in isolation. 2. You must actively participate. The forums provide all team members with the opportunity to add their perspectives and thoughts to all idea development. This tactic allows my team to bypass the arduous step of building “buy in,” since everyone is required to participate in idea development at its earliest stages. I do not attend these forums; my presence would change the creative dynamic. Each forum facilitator reports back to me each month during our monthly meetings. These regularly scheduled opportunities to speak freely and openly with me about the priorities and action items that come out of the forums provide me with the information I need to ensure that we are all moving in the same direction, together, and that everyone has the same level of understanding and general knowledge necessary to effectively articulate the library’s goals and priorities, regardless of title. Each team member is a well-informed ambassador due to the part he or she plays in developing and prioritizing all ideas. After I review each forum’s notes, I forward them to the entire team, ensuring that every person has an opportunity to think with the group, to provide input, to comment, and to be heard. Since everyone cannot be at every forum, sharing the notes levels the playing field and allows for participation and input across the organization. Assessment, both formal and informal, is the companion piece to our proposal process. I adapted the FFL Assessment Tool by slightly altering the great work of Gilchrist and Zald, and adding a “communicating results” field. We use this seven-step assessment tool for program series, regular events such as STEAM learning camps and fundraisers, major events such as summer learning, collections and access, our service spaces, and more. In addition, we have developed several other approaches, which are companion pieces that provide us with additional information and feedback to consider as we work to continuously improve all that we do. We work hard through our assessment processes to find the balance between program stats versus qualitative evidence of skills and/or knowledge gained, relationships formed, and satisfaction and learning achieved. One important part of our assessment involves gathering evidence on how patrons use and benefit from our offerings. The FFL offers one-on-one sessions by appointment so people can fulfill any need, such as getting resume help or tech assistance. We also use one-on-ones to certify individuals on equipment in our Fab Lab (3D printers, sewing machines, etc.). It is quite simple to gather the quantitative data (the number of certifications we do) to justify a sustainable budget for the service. Knowing that we have certified more than 4,000 people since 2013 in our Fab Lab is impressive, but I am equally interested in understanding the outcomes of these certifications. What are individuals doing with their new knowledge and skills? What is the impact of providing free access to a makerspace in our community? We use a One-on-One Appointment Patron Survey to help us better understand the value of these sessions. Since our first-of-its-kind Fab Lab has become a model for the country, we’ve hosted library workers, administrators, technologists, educators, teachers, students, writers, and professionals from diverse industries who have wanted to learn about it. To collect data from them, I created an Innovation Tour Survey to provide useful outcomes info beyond attendance numbers. The survey helps us understand what people are doing with the information and inspiration that they get during their tours, and we like to hear about what they set up for their own communities as a result. 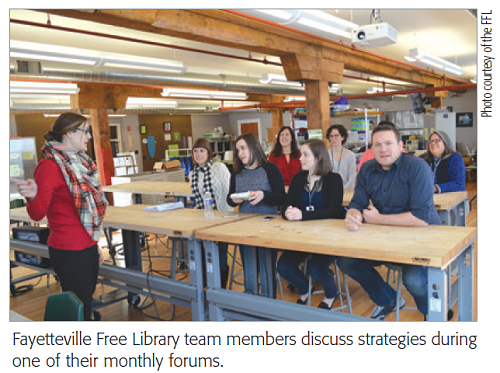 As librarians, we are experts in identifying trends and forecasting service and program needs based on information and feedback we gather from our local community and the larger society. At the FFL, I facilitate regular informal and formal information-gathering strategies that help us understand what is important and valuable in our community today. One way to do that is to get local citizens to work with us directly. In 2012, I attended R-Squared—The Risk & Reward Conference in Colorado (www.rsquaredconference.org) and had the pleasure of meeting and learning from John McKnight, co-author of The Abundant Community (www.abundantcommunity.com). McKnight’s basic premise is that every community already has all that it needs within. Our challenge is to find ways to reach into the community and engage with the talent, expertise, and enthusiasm that are already there and use the library platform to create conditions for neighbors to share their knowledge. Even more compelling, these conditions can foster the development of new knowledge through invention and entrepreneurship. I came back excited about developing a meaningful way to engage and inspire our own community to share and create knowledge. Would you be interested in sharing what you love/know with your neighbors? The idea is to give the reins back to the community: Rather than the librarians recruiting volunteers to fill our identified needs, we ask community members to give their time to each other by sharing their expertise and passion directly. The result of this simple shift in thinking has completely transformed our program- and service-delivery model. Today, community members are coming together in ways we could never have anticipated—they’re teaching each other how to cook, sew, code, craft, and more. As a result, we’re able to offer an ever-increasing, diverse array of opportunities to our patrons that staffers would never have had the knowledge or time to do themselves. There’s another way we learn what our patrons value here at the FFL. Borrowing from the great work of the Lavery Library at St. John Fisher College (www.sjfc.edu/library), we developed an informal tool we call “Capturing Stories,” which makes it easy for all team members within our organization to participate in logging the qualitative data we need to effectively assess our current offerings and to continue to improve. I have included a screenshot of the online Capturing Stories form here. This is how it works: Anytime and anywhere members of my team hear citizens say something that helps us to understand their experience with us, good or bad, they are empowered to take a quick moment, open this online form, and “capture” that story, comment, or feedback. This information is sent to our marketing director and me. As you can imagine, the data that results from these stories serves countless purposes: We use it for advocacy and elevator speeches, as sound bites for promotions, and as lead-ins for potential partnerships or grants. But most importantly, they’re a direct line to our members to help us understand how we are doing. In order to ensure that the whole team realizes just how essential it is to capture these stories, we incentivize the task by randomly choosing a story each month and giving the submitter a free lunch from the FFL’s Cafe 300. The FFL places the highest organizational priority on working together to bring diverse, innovative ideas to life, and outcomes-based planning helps us do that. We are all interested in finding better ways to tell our stories in order to communicate our outcomes and value more effectively. We use the tools and processes explained here to help us focus our priorities and work together in support of each other and our community. Sue Considine is the executive director of the Fayetteville Free Library in N.Y. She holds an M.L.S. from the University at Albany. Considine is an experienced speaker on contemporary library issues, including leadership, innovation, change management, team building, and organizational design. She is proud to have facilitated the development and launch of the first free and openly accessible makerspace in a public library, the FFL Fab Lab, in 2013. Her email address is sconsidine@fflib.org.